Our class collected 84 nonperishable items. Thank you! A group of students volunteered this week to decorate our classroom door during their recess time. This committee created a fantastic representation of the class' favorite book The One and Only Ivan. This committee designed and executed the entire process. They also found a way to incorporate all classmates by having students write traits of the main characters. 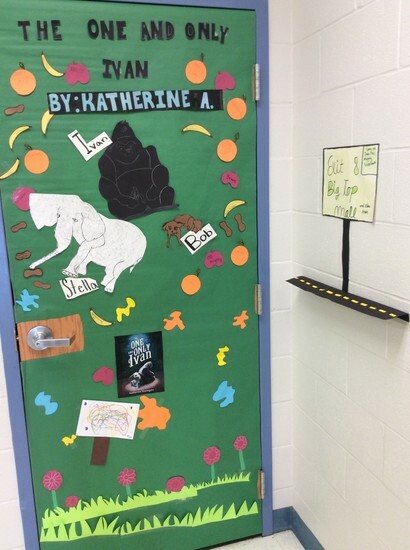 On December 18, we'll walk around the school to enjoy the other classes' favorite books displayed on their doors. 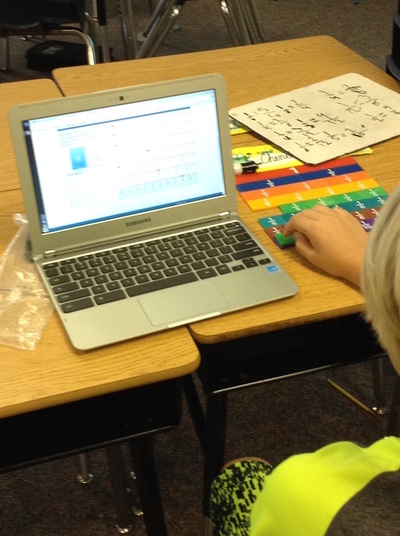 On Monday, students reflected on their progress on the Chapter 3 Adding and Subtracting Decimals' learning targets. As a class, we reviewed the ordering decimals, and I will work with some small groups of students next week to review rounding. As the year is quickly flying by, we had a class meeting this week about students being reflective as they learn new concepts and taking on an advocate role by asking specific questions. Several students took this message to heart and found extra practice to do in their math books on specific topics or asked for more. They also asked very specific questions and now understand the concept. Self-advocacy is going to be very important once students are in middle school. In Chapter 4: Multiplying Decimals, students reviewed powers of 10, which they learned at the beginning of the year and are using that information to multiply by them. Students discovered that moving the decimal point is a very quick way to solve those types of problems. For example, 45.67 x 10 = 456.7; 45.67 x 100 = 4567; 45.67 x 1000 = 45670. At the end of the week, students used decimal models to multiply (repeated addition). Today, two students did an outstanding job explaining how they noticed the use of distributive property and the application of moving the decimal point to use the multiplication algorithm with decimals. Please feel free to have your child complete additional practices in their Chapter 3 Math Book to review. I will give students a short assessment next week, so they can demonstrate their progress. Our reading focus standard for this quarter: RI 5.2 - Determine two or more main ideas of a text and explain how they are supported by key details. Our current social studies standard: Outline the discovery, exploration, and colonization of America. Students completed their essays about one of the antonym themes of Titanic: heroism and fear, humility and arrogance, wealth and poverty, or life and death. They used evidence gathered from several sources to construct their responses. Writing this expository text allowed students to review the main idea/detail text structure, and they tried some strategies to write topic sentences such as using a number word (several, numerous) and an action word. Students recorded their progress on the main idea/detail standard while reviewing their "Animals of the Rainforest" dipstick this week. As a class, we used it to practice writing an overall main idea. Finding the main idea of each paragraph and then finding the relationship between those main ideas is key to determining the overall main idea of a text. We also completed an additional paragraph main idea practice this week on the topic of the American Revolution. Students used the strategy of underlining the important words in each sentence and then looking for the relationship between the details. Then the class picked out a few key words to use and created a main idea sentence that could act as an umbrella to all of the other details. Students flash-drafted their memoirs this week using either an essay, narrative, essay structure as was used in "Eleven" or an essay with several narrative examples such as "Quietly Struggling." They were completing some very powerful work developing a wide variety of themes. We also reviewed regular past, present, and future tense verbs. Students explored the causes/effects of the French and Indian War, including how it fueled the American Revolution. In Project Lead the Way (PLTW), students completed their test beds and used them to learn about In-puts and Out-puts. Groups had to problem-solve through the next steps - connecting cables to the robot brain and remote control. They, then, noted how the in-puts, using certain functions on the remote, affected the out-puts, direction and speed of the wheels. Students tested the color sensor and how it affected the wheels as well. The Major Saver collection dates are Dec 9 - Dec 16.